This is the debut of the first Dauntless neck knife, made for us by Kirby Lambert. Lambert’s Dauntless uses sweeping curves and long lines to create a refined, yet robust and utilitarian aesthetic. Don’t be fooled by its deceptive beauty, this compact neck knife was built to be extremely capable and handle a multitude of cutting tasks. 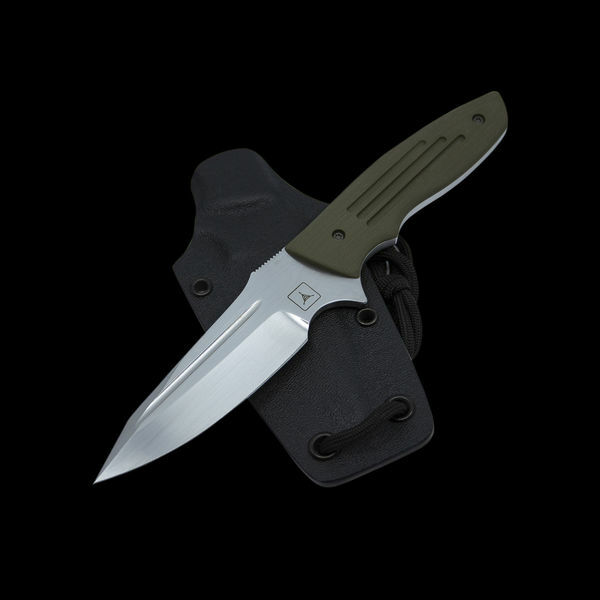 Incredibly thin and lightweight this Dauntless neck knife carries effortlessly until needed. Once deployed from its Kydex sheath you have a tool with a full grip and a 3.17” CPM 154 cutting edge in front of the forward choil. The versatile clipped bayonet style blade can tackle most tasks with ease. The hand rubbed satin finish resists scratches from deployment and use. 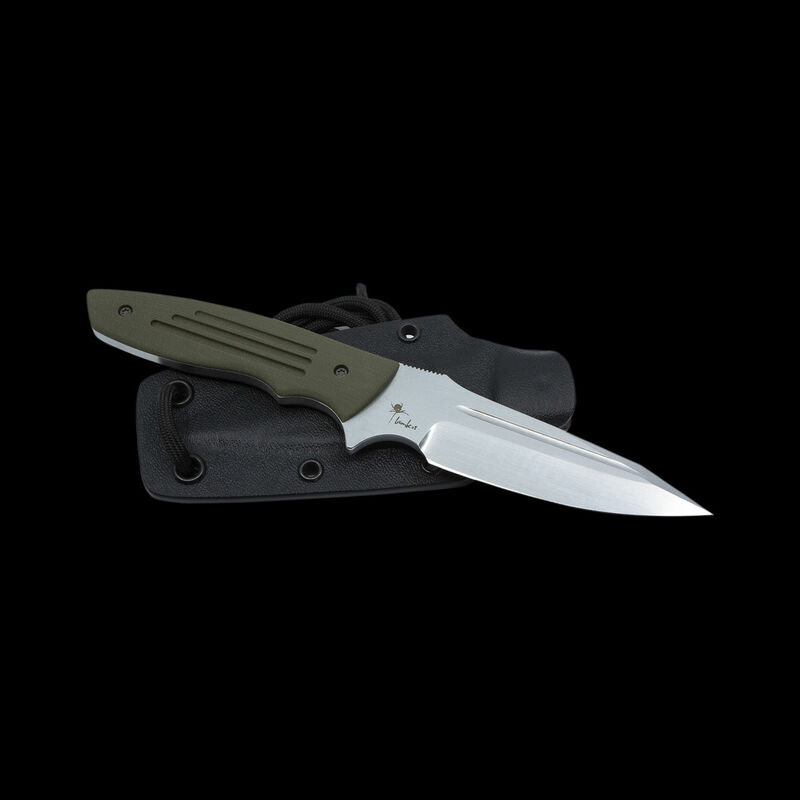 The handle features the classic Dauntless deep choil, thumb ramp and boat tailed grip in contoured OD Green G10. 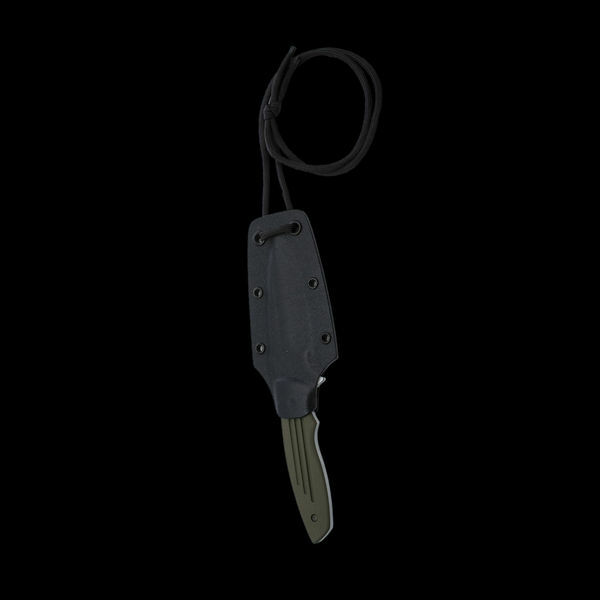 The Kydex neck sheath can be worn around the neck with the supplied cordage and is spaced to accommodate a small Tek Lok and Mummert Slotted Ti clip for versatile carry options. Rounding out the package, the Dauntless Neck Knife has three fullers in the G10 handles and single fuller through the blade. Our logo mirrors Kirby’s on opposite sides of the ricasso. The CPM 154 blade, with its hand rubbed finish, features a modified bayonet blade with fullers and a swedge. Choke up on the front choil to get a secure grip. A raised thumb ramp provides better resistance as you carve out fine details. The OD Green G10 slabs, matches Lambert’s design style. This lends to a great natural contour that nests comfortably in your hand. Our distinct triple fullers are on the OD G10 handle while a single fuller runs through the blade. The Triple Aught Design logo and Lambert Knives logo are chemically etched onto the base of the blade. The Kydex neck sheath can be used with the supplied cordage or fitted with a small Tek Lock or Mummert Ti Clip for belt carry.